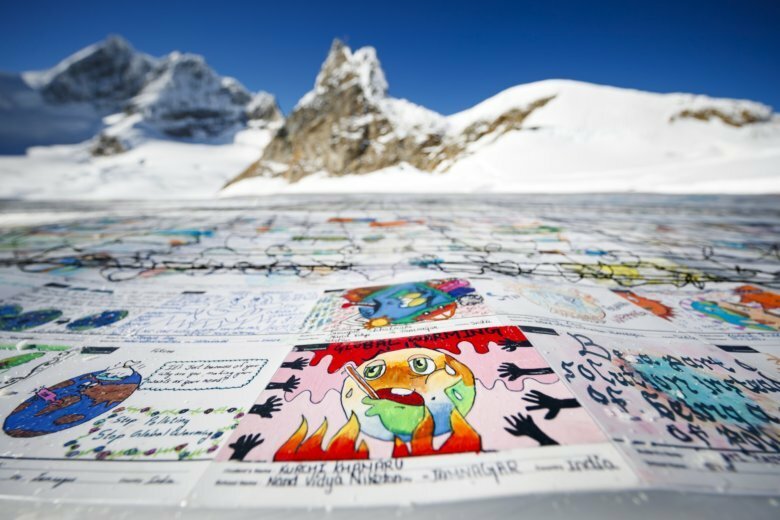 ALETSCH GLACIER, Switzerland (AP) — Kids across the world expressed concerns about global warming by joining forces to create what organizers say is the world’s biggest postcard on a glacier in the Swiss Alps. Bearing messages of hope and commitment, more than 125,000 colorful and hand-written postcards from kids around the world have emblazoned a glacier in Switzerland to create one giant one, half the size of a football field. It’s a cry of help — from New Orleans to Hong Kong, from sub-Saharan Africa to India — ahead of an upcoming U.N.-backed climate conference in Poland next month. The Swiss development and cooperation agency and partners unfurled Friday a “compound postcard,” on top of the threatened Aletsch glacier, the longest and deepest in the Alps and which is on track to melt to nonexistence by the end of this century if global warming trends continue. Guinness, though, said the attempt has not been registered. The current record is only 16,000. Pinned down with clamps and nets, and laminated in long glued-together strips to protect them from the ice and snow, the postcards bore messages of efforts to fight climate change and help the environment: limiting water use, promises to use public transportation, or recycling old goods before buying new ones among them. “They are asking us and their leaders to take action to preserve the planet Earth for them to have a future on it,” said Oceane Dayer, founder of Swiss Youth for Climate. Ever mindful of the impact, organizers are calculating the CO2 footprint caused by sending so many postcards — often through Swiss diplomatic posts — and preparing to double the offset, or compensation. Drones equipped with cameras buzzed overhead as bright sunshine bounced off the white mountainside. Overhead, cards spelled out “Stop global warming” and “#1.5C” — an allusion to the goal of keeping global warming below 1.5 degrees Celsius (2.7 degrees Fahrenheit). Organizers want to launch a ‘Global Climate Change Youth Movement’ to play into the U.N. Framework Convention on Climate Change in Katowice, Poland, known as COP24, next month. And organizers plan to use a snapshot of the giant compound postcard to make, well, a postcard.